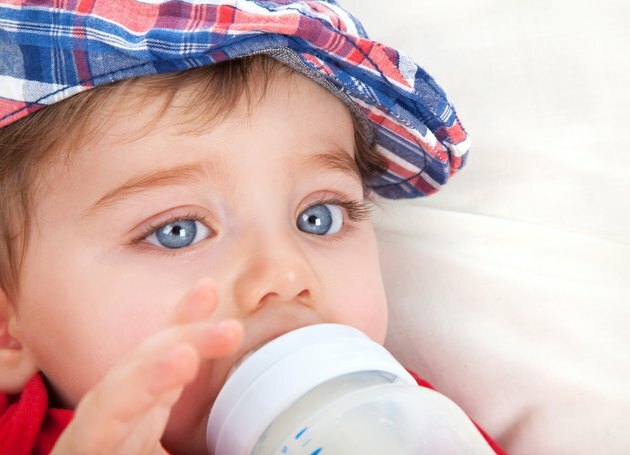 By four months, a formula-fed infant will still be relying on formula for all of his nutrients. The parents should spend the first few months observing his eating habits and mix bottles according to what he normally drinks. At four months, he is moving out of the newborn stage and will begin settling into a comfortable feeding schedule. A baby who is 4 months old should have a bottle every 3 to 4 hours, including through the evening hours. If the baby is exclusively formula fed, she will probably drink about 4 to 6 ounces at each feeding, says Kids Health. However, each baby is an individual and each feeding needs to be treated independently. Sometimes, she may drink the whole bottle and other times she may become full before finishing it. Women who breastfeed but supplement with formula will not need as much formula for the baby. Some women choose to formula feed during the day and breastfeed at night. The baby should be offered a 4 to 6-oz. bottle during the day, but don't be surprised if he doesn't drink it all. He may be looking forward to his breastfeeding time with his mother and may drink more breast milk at night to compensate. Some parents will choose to begin solid foods at this stage in the infant's development. If she has lost her tongue thrust reflex, doesn't seem full on milk alone and has excellent head control, she may be ready. Mix formula into a little rice cereal to give the baby a chance to taste it off a spoon. The cereal should be very runny at first and get thicker with time. Even if you are giving your baby a little bit of cereal each day, do not cut back on the amount of milk you give her. Breastfed babies choose how much breast milk to consume, whereas formula-fed babies are given a set amount of milk in a bottle. It is very easy for a parent to encourage the baby to finish the bottle, but it is important not to do this. Allow the baby to self-regulate, says Family Education. He will give signals when he is full, such as pushing the bottle away or shaking his head. Family Education also explains that 4-month-old babies who drink formula do not need any other liquid to keep them hydrated.